Eco was one of four young peregrines introduced to Richmond Hill in the summer of 1999 through the Canadian Peregrine Foundation's Project Release. He and his three brothers were released from the hack box on June 28, and gradually began to acquire the skills required for independence over the course of July and August. For much of early September, Eco was still being seen in the area of the Richmond Hill Town Hall. Our first report of Eco being "away from home" came on Friday September 17. See the map below for a summary of his journey, and check the "Traveler's Diary" under the map for commentary on his progress. March 23, 2001: Location unknown We have yet to receive any confirmed reports of Eco since his transmitter fell silent in December 1999. However, with spring migration underway, it's worth reminding everyone to keep an eye out for Eco again this spring. It would be wonderful to rediscover him and learn where he is now residing. Please contact us at marcel@peregrine-foundation.ca if you think you may have seen Eco. March 30, 2000: Location unknown - possibly southern Ontario? Recent sightings strongly suggest that Eco and/or Lincoln have returned to southern Ontario. Neither transmitter has communicated with the satellite since December, and it is safe to assume that they will not become reactivated at this point. It is therefore critical that we receive eyewitness reports about these two birds in order to track them down again this spring. Please call us immediately at (416) 481-1233 or 1-888-709-3944 if you spot an immature (brownish) peregrine falcon with a satellite transmitter on its back (look at this photo of Lincoln to see what it looks like). The first sighting was by Larissa Neumann on February 24. While driving on the Queen Elizabeth Way in Burlington, she spotted a peregrine flying past the highway near Burloak Drive, and was surprised to see an antenna coming out of its back. The description she provided to us left us convinced that she had seen a bird equipped with the type of transmitter we had put on Eco and Lincoln. There is an outside possibility that this bird is from the Alberta research program, or another effort we are unaware of (possibly local monitoring by a falconer). However, the odds are that the bird seen by Larissa was either Eco or Lincoln. On March 6, a birdwatcher passing through Stoney Creek observed a peregrine flying past with what appeared to be stick coming out of its back. Upon learning about Project Track-'em, she realized that the "stick" was likely an antenna. These two sightings gave us strong hope that at least one of Ontario's birds had returned safely, and we turned to the media to help us locate it/them. Hamilton's OnTV, Toronto's CITY-TV, the Globe and Mail, the Hamilton Spectator, the Guelph Mercury, and the Richmond Hill Liberal have all provided good coverage, and as a result we have been able to follow up on several more sightings since. Within the past week, there have been several more confirmed sightings in the Toronto area. On both March 23 and March 28, a peregrine wearing a transmitter was spotted hunting over the duck pond at the southeast corner of High Park in Toronto's west end. The most recent sighting there was around 2:30 pm on Tuesday, March 28. Less than 4 hours later, Natalie Helferty spotted a peregrine with an antenna near the CN rail yards at Keele and Highway 7, just north of Toronto. While it's possible that this was the same bird, the description of the position of the transmitter (as well as the fact that the "High Park peregrine" had been sedentary for close to a week) suggests that there may be two different birds in the area. If that is the case, then it may well be that both Eco and Lincoln have returned safely. Before we can draw any conclusions, we will have to get a leg band reading from these birds. We encourage everyone to help us in the search for these birds - if you can visit either High Park or the Keele / Highway 7 area over the next week of two, bring along a pair of binoculars (or a spotting scope) and be prepared to look for a black leg band on the peregrine if you are lucky enough to spot it. Please phone in any sightings (from these locations or anywhere else) to 416-481-1233 or 1-888-709-3944 as soon as possible. Several CPF volunteers will be out searching as well, and we will report on any progress as soon as possible. December 15, 1999: Location unknown. It has now been six weeks since we last received a clear signal from Eco, which strongly suggests that something is amiss with either the transmitter or the bird. Hopefully it's simply a matter of the technology having malfunctioned, and Eco is still alive and well. If this is the case, we hopefully will get a sight report of him at some point in the future (as peregrines with a backpack tend to attract a bit of attention from observers...). November 24, 1999: Location unknown. Eco is unfortunately still missing in action. He may well be perfectly healthy (and for that matter the transmitter may be too), but for whatever reason we haven't received a signal for over two weeks. Given that we've missed signals in the past, and we know that the likelihood of this increases as the birds approach the equator, it could very well be that all of a sudden we will hear from Eco again. We'll just have to wait and hope. November 8, 1999: Location unknown. Three transmissions came in from Eco tonight, but unfortunately none of them gave a clear location. He may well still be in Panama or could be far beyond by now - we'll have to wait another four days for our next opportunity to find out. The lack of usable data today prompted me to look back at some of the technical details that we receive with our satellite transmission. At present, each transmitter is broadcasting for six hours straight, every fourth day. The Argos satellite circles the globe, and each time it comes within range of the transmitter, it receives the signals being emitted by it. During a pass, the satellite may receive one or more signals from the transmitter over a period of several minutes. In order to get an accurate fix on the location, the satellite requires at least four such signals during a single pass; this allows it to pinpoint the location to within one kilometre at worst, and 150 metres at best. However, with only two or three messages, the satellite cannot accurately triangulate the location, and there can be considerable error in the estimated position of the bird. A single message cannot be interpreted at all, and this is what happened with Eco on all three passes today. Before putting the transmitters on the birds, we did a bit of experimenting with them. We found that to get the most precise readings, the transmitter had to be fully in the open, without any obstruction at all. Even a thin board, or single sheets of plastic or glass reduced the accuracy of the analysis. Most of the time, the peregrines are enough in the open (at least as viewed from above where the satellite is) that the signal gets through fairly well, and so we receive usable data the majority of the time. But on occasion, the birds may happen to be in places where the signal can't get out well when the satellite passes. This is more speculation than fact, but as an example, I imagine that if one of our birds were on a south side ledge of a building or cliff (especially with overhangs), it would be very difficult for the satellite to get a clear reading because it circles the northern hemisphere. I'm sure there are many other situations too where the transmitter and satellite would have difficulty making contact, but it's hard to know what these are. We just hope Eco won't make a habit of frequenting them. November 3, 1999: 9.6N,79.8W. Eco has not traveled far in the past four days. He is now located on the north coast of Panama, near the town of Portobelo, a short distance east of the Panama Canal. The next coordinates we receive from him (expected November 7 or 8) should give us a better indication of whether he is settling in here, or is just resting in preparation for another longer flight. October 30, 1999: 9.1N, 81.5W. This time Eco appears to be taking the direct approach, and has indeed reached land in Panama. Interestingly, his location is very close to Nate's last reported position of 9.2N, 80.8W on October 27. It's possible that the brothers have reunited down there, but we'll never know for sure. Eco has likely already been in Panama for a few days, given that he was migrating over water when we last heard from him on Oct. 25. Conversely, Nate was certainly in Panama on Oct. 27, but may have lingered there for a while (or for that matter may still be there - we won't know until he transmits again, likely tomorrow night). It's therefore easily possible that both were in Panama at the same time, and considering the incredible eyesight of these birds and the short distance between the reported locations, Eco and Nate may well have spotted one another. This latest development is an interesting one for us to consider. Eco and Nate are brothers nearly identical in age, and both received their satellite transmitters and were released on the same day (Sept 1). Despite all the conditions being the same for both of them as they grew up in Richmond Hill, they have shown considerable differences since - Nate adopted a fairly direct and steady pace of migration, whereas Eco has been very erratic in his movements. Yet after all of these travels, they have ended up virtually together, thousands of kilometres away from home, and six weeks after they last saw each other at home. Now we of course are wondering whether the brothers will stay together, or diverge again. All indications are that they are still very much on the move, so we may not know the answer to this question for a while yet. October 25, 1999: 18.8N, 81.6W. Eco is on the move again! As if to prove me wrong (see my October 20 comments), Eco has abandoned the northern Florida area where he spent most of the past two weeks. At some point in the past four days, he began heading south through the State of Florida, and then flew across to Cuba. He may or may not have rested there for a little while before heading back out over the water. As of tonight, he was over the Caribbean Sea, just southwest of the Cayman Islands. If he continues on the path he has followed (almost due south from Jacksonville, Florida), he will hit land next in Panama. 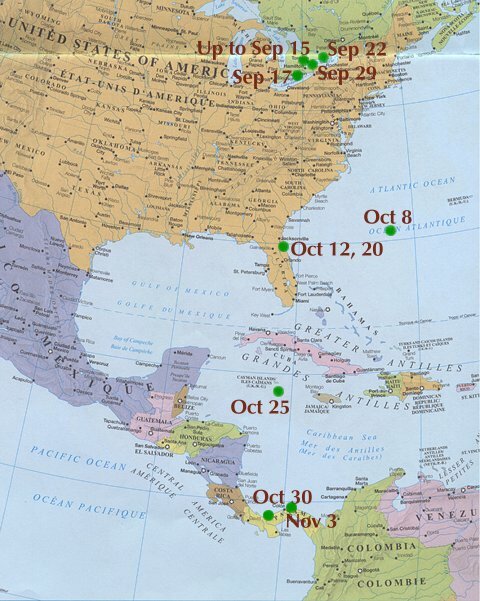 On the other hand, he may swing southwest to rest in Honduras (shown in green on the map at right), or Nicaragua (shown in purple, and the most recent known location for Eco's brother Nate). October 20, 1999: 29.8N, 81.3W. Eco is back in transmission range again, and it appears that he has decided not to move far from his last position. He remains in northern Florida, near the Atlantic Coast, close to the town of St. Augustine. Considering that he has been in this general area for more than a week now, it's possible this is where Eco will settle for the winter. However, it's still too early to draw any conclusions - it may simply be that he is resting there in preparation for the next leg of his journey. October 17, 1999:For the past two days, we have received a series of satellite readings from Eco, but none of them have contained any legible data, so we can't say where he is at the moment. There are a number of potential explanations for this. Most likely, the atmospheric disturbance of Hurricane Irene may have interfered with the ability of the signal to travel from the bird to the satellite. It's also possible that in trying to find shelter from the storm, Eco has hidden in a place (e.g. under a roof) where the signal is blocked from getting out. We hope that the transmitter will return to normal function later this week. October 8, 1999: 30.6N, 71.7W. For some reason we received no transmission from Eco on October 4, when he was "due", according to the four-day cycle his transmitter is on. This could be due to any number of factors which can interfere with a clear signal getting from the bird to the satellite. The good news is that we did get a reading tonight, and it is a very significant one. 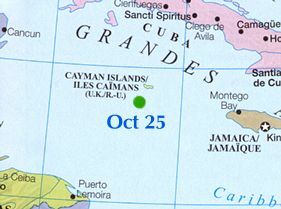 The coordinates suggest that Eco well out over the Atlantic, roughly midway between Bermuda and Miami on Florida's east coast. I should note that we only received one transmission today (during an average broadcast we receive at least two or three) and thus it is difficult to confirm the location (for each transmission, we receive two sets of coordinates - the first pair is correct over 90% of the time, but due to the vector calculations made by the satellite, the alternate coordinates are sometimes the ones giving the true location). 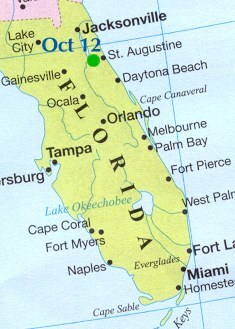 In this case, the alternate location would place Eco in the middle of the Gulf of Mexico, roughly 500 km southwest of Tampa, Florida. September 30, 1999: 43.8N, 79.0W. Eco has changed his mind again, and is heading back west. Late this morning, several observers at the Cranberry Marsh Hawk Watch in Whitby were surprised to see a peregrine fly past only a couple of hundred metres away, with what appeared to be a wire coming out of its back. This was of course the antenna attached to the transmitter. We guessed that it was likely Eco they had seen, based on his previous travels, and this was confirmed when we received data from the satellite placing him in the area of Ajax / Whitby. Now that Eco has moved west along the shore of Lake Ontario from Presqu'ile to Cranberry Marsh, it will be interesting to see whether he continues to follow the shoreline as most raptors do in fall migration, or else heads off in an unpredictable direction, as he has done a few times already. September 22, 1999: 44.0N, 77.4W. It would appear that Eco is becoming quite the traveler! On September 15, he was still in Richmond Hill, but had flown ~200 km southwest to Long Point on Lake Erie by September 17. Today we received the first data from the satellite transmitter since he left Richmond Hill. To our surprise, he is now located near Presqu'ile Provincial Park, in the area between Colborne and Brighton on the north shore of Lake Ontario (~150 km east of Toronto). This means that in the past week he has turned around and flown back in a northeasterly direction. Where will he go next? September 17, 1999: 42.6N, 80.3W. Eco is finally on the move! Observers at the Breakwater migration monitoring station at Long Point, Ontario spotted a peregrine with a backpack transmitter flying past their station today. Part of his band number was visible, and we were able to confirm that it was in fact Eco that was seen there. We are presently receiving satellite data from Eco roughly every 6 days. We eagerly await the next transmission from him to find out his latest location.